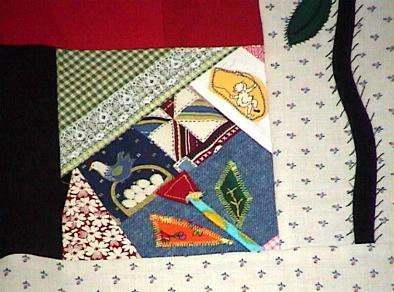 This is a pretty, colorful and unique new Appliqued, Embroidered Crazy Quilt Top that I made. 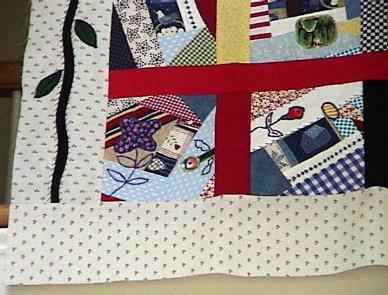 There is so much excitement on this quilt top. 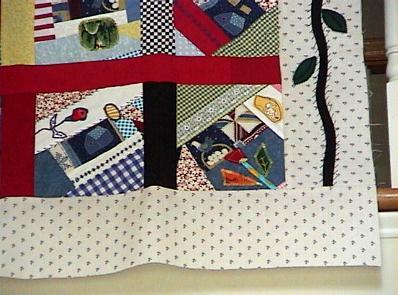 The black and white fabric(below) on the top is Englebreit. Notice the hand embroidered yellow daisy in the photo below. 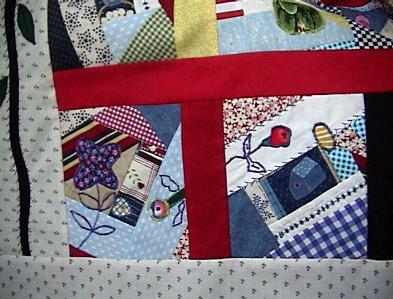 The red and white daisy fabric is Aunt Grace by Marcus Brothers. There is actual hand sewing on some of the blocks. See photo below (around the cherries) and above (around the leaves) for two examples. Notice the cherries above - done in hand stiches. 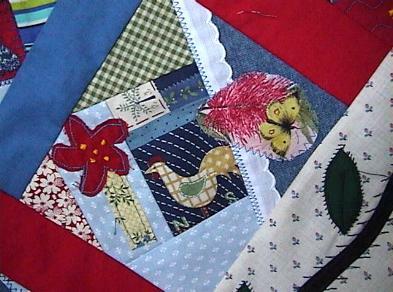 Lace, applique and embroidery is on each block within the top. Notice the 3-D ruched centers of the roses-above. 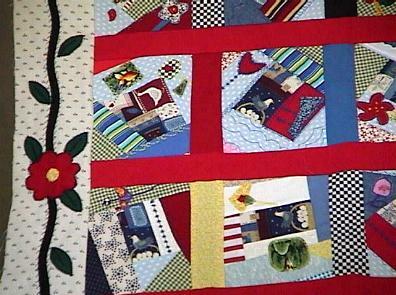 There are some Aunt Grace repro fabrics on some of the blocks. It took many hours to finish this. 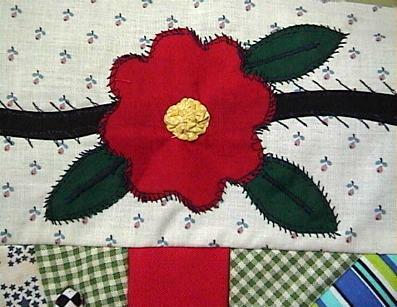 Notice the 3-D Appliqued roses on the longer side borders. The leaves are detailed with spines down the centers. 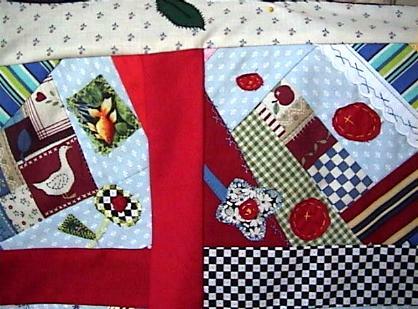 The threads have been clipped from the back of the quilt top. 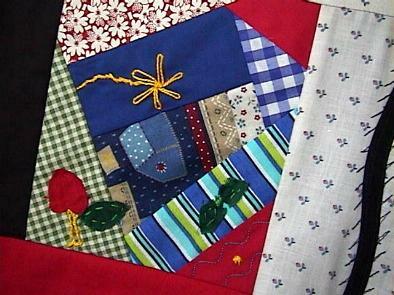 I've added lots of photos so that you can get an good idea of all of the goodies on the quilt top.
! !Let the cute little goldfish above swim into your life!! 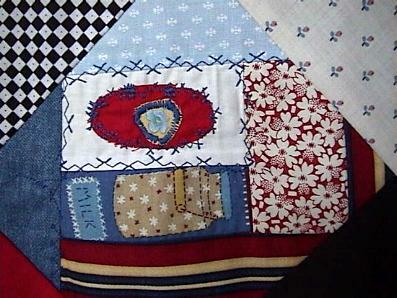 Add an extra border if you would like a larger size quilt. Made with mostly 100% cotton good quality fabrics. Only about 3-4 of the fabrics are cotton/poly blends. Some of the fabrics are MUMM. 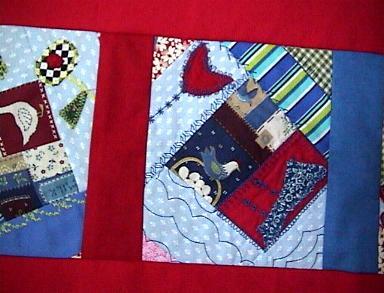 The border fabric is by Waverly. Turn this into a family heirloom. 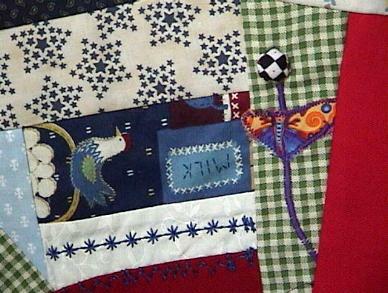 Use it throughout the year as a conversation piece, a wall quilt or a lap quilt, or a bed quilt. This is the top only. 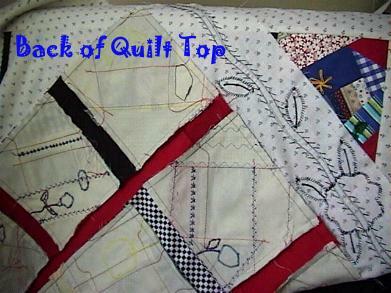 You add backing, batting and your favorite quilting design. 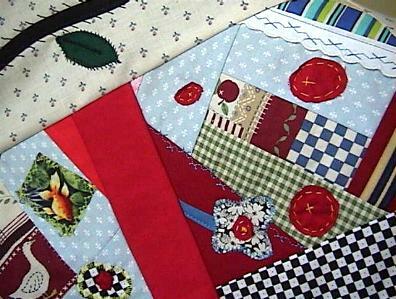 Your lovely quilt top will be shipped via priority mail.